Thanks to the kindness and generosity of our community—alumni, families, parents, and friends—UCDS continues to thrive. The UCDS Fund is foundational to our viability, helping to elevate and amplify our innovative programs and to celebrate lasting, community-supported success. What is the UCDS Fund? The UCDS Fund is foundational to our viability, helping to elevate and amplify our innovative programs and to celebrate lasting, community-supported success. Annual giving to the UCDS Fund provides an opportunity to contribute in a way that is personally meaningful to any donor. Every gift makes a difference. And every year, your generosity has impact. The Fund provides essential operating support, helping to sustain the very things that set UCDS apart, such as our 8:1 student teacher ratio. 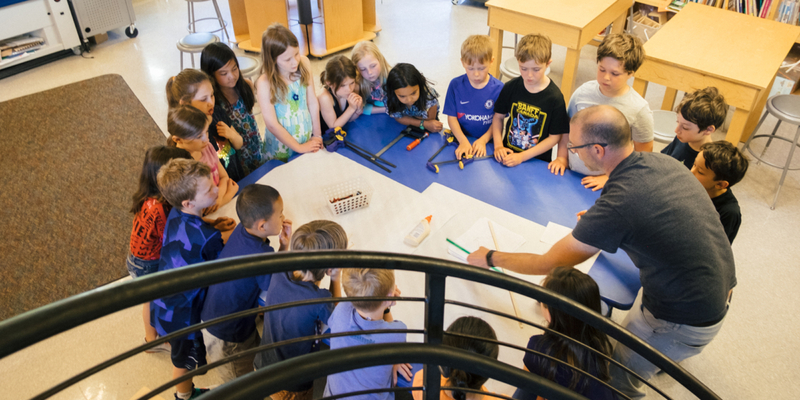 And your gift elevates programs like our laboratory classrooms, which support our students as they learn to collaborate and explain their thinking. A portion of every gift also goes to our Forever Endowment, ensuring a strong and vital tomorrow. The Endowment secures our ability to provide financial aid, making our programs accessible to as many students as possible. It also helps keep the very best teachers in our classrooms by providing the resources for educators to take classes, speak at conferences, and have the best tools at their disposal to elevate their work with our students.